A third of the way into the film, I asked myself why I had bothered to come. Two-thirds of way into the film, I was looking forward to it being over. In a fit of generosity, I will say it is okay but I'm afraid, for me at least, the novelty has worn off. This is the type of thing you see on a vacation family night; this is not something you shell out fifteen plus dollars to see even if it involves IMAX 3D. I'm sure there are twenty year olds everywhere who are lapping this up like it's candy. However, when you're three times twenty years old and you have a life time of experiences involving Star Wars, Star Trek, The Matrix, and decades of comics, science fiction novels, etc., etc., you get bored three times as easily. I'm certain the film will make a tidy profit for the film company but this will be coming from a younger crowd, a new generation of fans. I wouldn't be recommending it to anybody I know. What do I know? Roger Ebert liked it. He gave it three stars out of four. Hmmm, I would have given it two. Admittedly though, it is technically a good piece of craftsmanship. In the end, if you're a new fan, you'll probably enjoy it. If you're a diehard fan, well, how could you not see it? But for anybody else, I return to this being a rental if you're stuck in your vacation timeshare with the kids on a rainy day and have nothing better to do. If you're going to shell out fifteen or twenty bucks, I'd stop and consider any one of a number of good films, better films you have not yet seen and decide on investing 2 hours of your life as wisely as possible. No matter what, you ain't gettin' it back and I don't care how good that movie popcorn tastes. It isn't exactly a persuasive argument for the continuation of the franchise -- but Men in Black III is better than its predecessor and manages to exceed expectations, largely due to Josh Brolin's impressive performance. Men in Black 3 (stylized as MIB3) is a 2012 American 3D science fiction comedy film starring Will Smith and Tommy Lee Jones. This film is the sequel to the 2002 film Men in Black II released on May 25, 2012, ten years after its predecessor and fifteen years after the release of the original Men in Black. It also stars Josh Brolin, Emma Thompson, Alice Eve and Jemaine Clement, with Barry Sonnenfeld returning as director, and Steven Spielberg returning as executive producer. The film is the third installment in the Men in Black film series which is based on the Malibu Comics series The Men in Black by Lowell Cunningham. Thanks to a smart script, spectacular set pieces, and charismatic performances from its leads, Men in Black is an entirely satisfying summer blockbuster hit. Men in Black is a 1997 science fiction comedy film directed by Barry Sonnenfeld, starring Tommy Lee Jones, Will Smith, Linda Fiorentino, Vincent D'Onofrio, Rip Torn and Tony Shalhoub. The film was based on the Men in Black comic book series by Lowell Cunningham, originally published by Marvel Comics. Lacking the freshness of the first movie, MIB 2 recycles elements from its predecessor with mixed results. 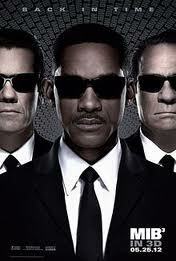 Men in Black II (stylized MIIB) is a 2002 science fiction action comedy starring Tommy Lee Jones and Will Smith. The film also stars Lara Flynn Boyle, Johnny Knoxville, Rosario Dawson, Tony Shalhoub, Patrick Warburton and Rip Torn. Let me say that although I liked the first “MiB” movie, I wasn't particularly looking forward to this belated sequel. But I had fun. It has an ingenious plot, bizarre monsters, audacious cliff-hanging, and you know what? A closing scene that adds a new and sort of touching dimension to the characters of J and K.